Banks Fund is the preservative accumulated amount of money those are collected by bank from various sources including internal & external sources. paid-up capital of bank are the capital collected from share selling. A bank must keep 10 millions money (with reserved fund) as paid-up capital for being scheduled to central bank. Because it's also owners capital of a bank. If it is more, then the easy direction by bank is possible. According to the decision of board of director such funds are formed by bank with the help of a few money collected from earned divided. There is no specific rate for general reserve. Board of director determines it depending on divided. Money maybe collected from such funds, if banks need any current capital. Commercial banks compulsorily collect which reserves at a particular rate determined by the central bank or government is called statutory reserve. According to the rules of central bank, the commercial banks are to form this reserve at 20% rate of divided until equal to collected capital. Such reserve is considered as source of banks owners equity. Except general reserve or statutory reserve, banks form various reserve fund such as- depreciation reserve, divided equalization reserve, sunk reserve, non-claimed reserve, premium reserve etc. for various objectives. After transferring & distributing the earned dividend into various reserve funds, the remaining amount in hand is called undistributed profits. This fund can be used as current capital. Share is sold in which price more than the actual share price is called share premium. Accumulating the premium amounts, bank creates share premium fund is used as source of fund. Without giving any part of divided among the share holder in necessity of current capital, if bank gives share as bonus is called bonus share. such share is the source of banks owners equity. Bank receives deposit from peoples through savings, current & fixed account. A big part of those deposits are preserved to bank for long time. That deposits are used as fund. Banks formed fund receiving loan directly from various sources such as - central bank , Other commercial banks, loan providing banks, stock exchange, selling various documents like deposit certificates, savings bond and other bonds, debentures etc. At last it's said that banks collect fund from various sources. 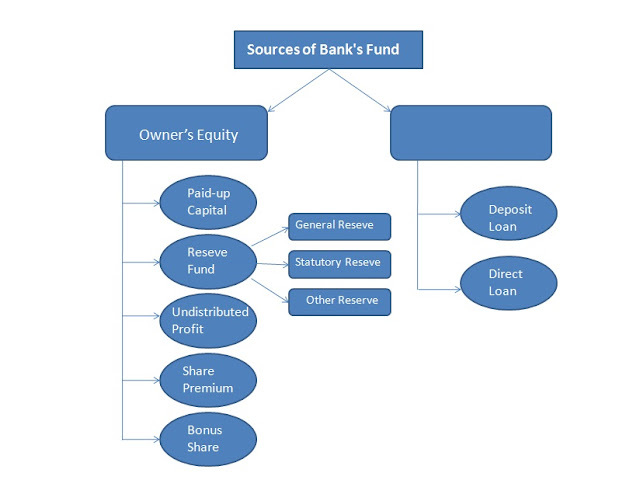 Creating various sources except the above discussed sources banks form its fund to create mobility or to adapt or exist to the current competitive market position.